And of course, the ultimate dance of the year, THE PROM! 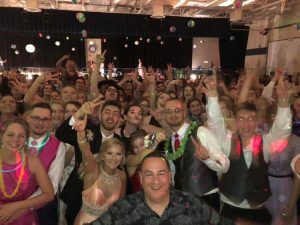 Hitman Entertainment understands how important it is to make that night THE most memorable night of a teenager’s 4 years in high school, by playing the perfect combination of high energy hits and slow dances, guaranteed to make each guest remember that one night for the rest of their lives. So why are we considered the #1 hit music DJ service in north central Ohio? It’s simple. Our playlist at school parties is extremely tight, playing today’s hottest hits, while mixing in only the very best of the “old school” and fun line dances! School administrators take note: We are the ONLY member of the SCHOOL DANCE NETWORK in all of north central Ohio, which is your school’s guarantee that we ONLY play edited versions of songs that eliminate questionable lyrics. And if a song is just too sexual in nature, the SCHOOL DANCE NETWORK flags it in a weekly list that MEMBERS ONLY have access to and we make sure won’t play it at school dances. We perform responsibly! Many principals prefer to hold dances after school, which is not a problem for us either. We generally offer lower rates if the dances are held after school. Contact us for all the details. We recommend booking any parties early in the school year, as many dates fill up quickly, especially around holidays, and in the spring. Here are some of the schools that rely on HITMAN ENTERTAINMENT annually for their school dances.